Just one short week until I’ll be packing all the dolls to take to the convention! Still lots and lots to do!!! Here is a first look at the dolls I’ve been working on. Next Post The Countdown to the UFDC Convention Continues – 7 More Days of Doll Making Left! mold or does it just look bigger the way the picture was taken. It looks just like an original one I’ve seen in the Antique Doll Collector Magazine article. All your hard work these past several months will reward you at UFDC. Hard work shows and good work shows. I’ll be thinking of you for the next 2 weeks and sending you good luck wishes. Fondly, Mary G.
Thank you !!! The large 22 inch doll is a new mold and I also have two other new molds as well. 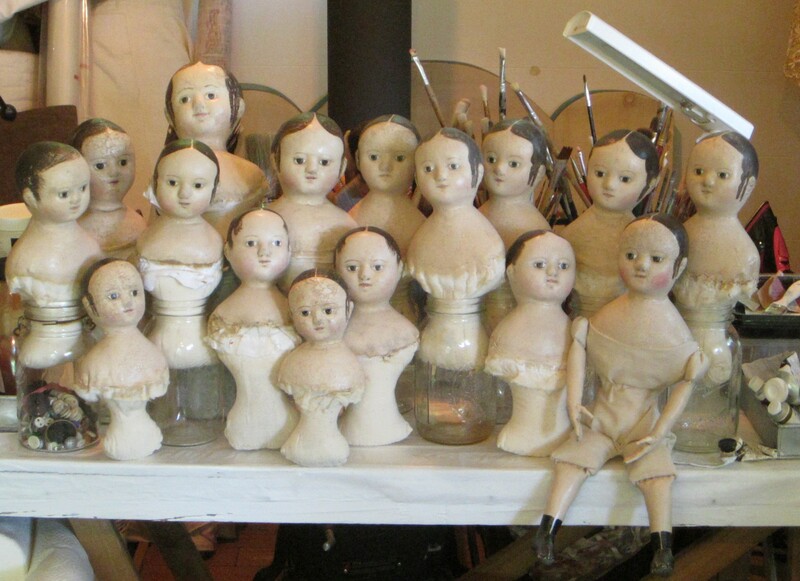 The two tiny dolls in the front row are made from the mold of the little Izannah I bought last October. The third new doll is just to the right of the large doll. Thank you Charlotte! Your whole hearted encouragement means so much to me! It’s always hard for me to do shows, since I usually develop an intense case of “stage fright” accompanied by pure exhaustion, so having your good wishes, friendship and love is a huge boost to my moral!